I grew up in a pretty special place on Sydney harbour and spent my childhood at the beach, watching boats come and go and fantasising about the waterborne gypsy lifestyle i saw so many living. I love the sound of rigging clinking on the mast, the salt water and feel of the spray, the sound of waves glugging against pilons. So when my neighbours sold up and left for a 3 year, round the world voyage on a boat, taking my 10 yo friend and her brother, i was pretty much green with envy; the closeness with your parents that it affords, the outdoor adventures and cultural wonders to be experienced, the sea, the beach, the sun. We now have a 7 year plan. 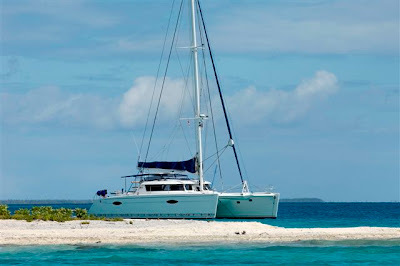 To buy a second/third/fourth (read affordable) hand Catamaran and say goodbye for 3-4 years to circumnavigate the world. The girls will both have finished school and can choose to join us if, when and where they wish and the boy will be a 7/8 yo bean, a perfect age to leave behind daily land life and go to sea to expereince the adventure that is ocean cruising. Do you have a long term goal or plan that fills you with so much excitement that you're just bursting? Lovely dreamy post Kel! Id love to join you guys, but being a bit un-boaty, this may not be possible! I once sank a small sail boat...so Id be hopeless as a deck hand! My dream is still a work in progress, but lately Ive been thinking of being able to design and renovate an existing building to be up a shared workspace that is part cafe/artist studio/gallery/ yoga centre. Not sure where, or when, or how, but imagining such a venue is fun...Im might call it FLEX. Jen - that sounds just fabulous. I can see it now. what a great dream, great, concept , i love those creative spaces, and i love the name. My dream is to move to a property with my parents and sister's family, and build a super eco-friendly house with shared communal spaces (replete with large fireplace and wood fired oven of course, not to mention the timber ceiling and exposed beams my carpenter BIL will incorporate), living almost self-sufficiently, but making some pocket money but running course and selling gourmet home made products. Well, a girl can dream can't she? LOL. I've always wanted to do exactly that....sail away to see the world with my kids. It was always just a dream, but I snapped up every book about a family that did it,imagining what it would be like. A big part of the dream for me was having the kids be the right age to enjoy it, and the time for that is passing, so I think my dream will remain a dream, but I'm looking forward to following your journey via blog someday! there will be a cold brew, of your choice, waiting for you when you get to San Francisco.The next seven years will go quicker than the past seven. You'll be here in no time. Keep us posted as you get close.For me, I just hope to singlehand to Hawaii and back. Sail on. el burro - we wll be doing the west coast of north america and canada, we'll pick you up and you can do 'a leg'. ! If im honest , its one of the reasons i really wanted another baby as the girls really just miss the perfect age to do it and i think its a fantastic expereince to have in life. Sailingcal29 - welcome back! You're on! Thanks for the offer. I love sailing san fran harbour, its almost as good as Sydney ( but not quite) LOL. You sailing lot are a mad bunch, when are you plamnning on setting off? What a wonderful dream. For me, it's to make my living doing what I love, being a craftswoman. To spend my days in my studio creating, to have a community of crafty people around me, to support other crafty women to realise their dreams and to travel the world as a craftswoman. Thanks for asking.